“You will now listen to my voice . 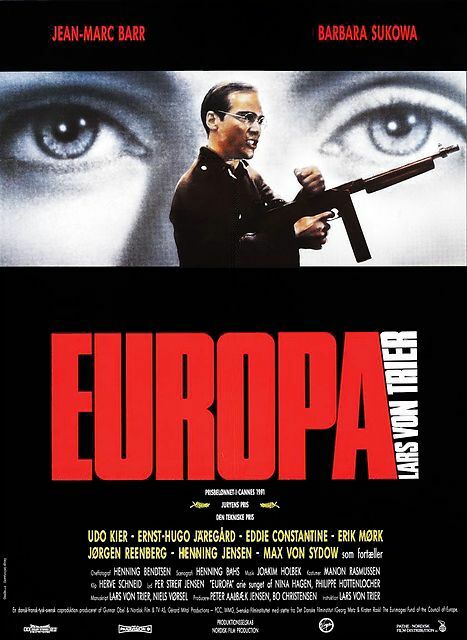 . . On the count of ten you will be in Europa . . .” So begins Max von Sydow’s opening narration to Lars von Trier’s hypnotic Europa (known in the U.S. as Zentropa), a fever dream in which American pacifist Leopold Kessler (Jean-Marc Barr) stumbles into a job as a sleeping-car conductor for the Zentropa railways in a Kafkaesque 1945 postwar Frankfurt. With its gorgeous black-and-white and color imagery and meticulously recreated (if then nightmarishly deconstructed) costumes and sets, Europa is one of the great Danish filmmaker’s weirdest and most wonderful works, a runaway-train ride to an oddly futuristic past.